Being that my parents recently got themselves a new puppy, the boys are very big into playing puppies. They run around constantly while one plays the dog the other the owner. Not only is their playing adorable but they are enjoying watching Pound Puppies even more now. On April 8th, 2014, Shout Factory Kids, in collaboration with Hasbro Studios, will release Pound Puppies: A Perfect Match on DVD! You can find the popular voices of stars like Eric McCormack, Yvette Nicole Brown, Michael Rapaport, John DiMaggio, Alanna Ubach, René Auberjonois, and M. Emmet Walsh. "Winner of the 2012 Humanitas Prize in Children’s Animation, the Pound Puppies series is currently airing on The Hub in the U.S. and YTV in Canada". 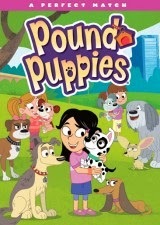 The synopsis says "The Pound Puppies find they have their paws full with their newest adventures! In A Perfect Match, the Pound Puppies come to the rescue when a so-called “un-matchable puppy” finally finds his match – and loses him, assist a shy puppy on a High Energy Scouts camping trip, help a furless pup to bolster his confidence, and they have to investigate why a paper girl’s deliveries are always late!" All of our dogs being rescues, the boys know the importance in this and watching the cartoon, they create their own shelters with their stuff animals. I think its so touching to see them learn these morals from watching our own examples and seeing it reinforced in the shows they watch. This was definitely another cute one from Shout Factory! Recommendation: Both boys enjoyed watching this and as I said I thought it was pretty cute! I definitely think at $10 its worth it to purchase since I know we sure have watched our moneys worth and will continue to! Giveaway: Shout Factory is going to give one of A Lucky Ladybug's lucky readers a Pound Puppies: A Perfect Match DVD of their own! I have two dogs, a cat, and a guinea pig. I have four cats, two dogs, and a bird living in my house! Right now we have lots of fish. Our guinea pig passed away. We have a zoo! Two cats, two dogs, and two rabbits. W have 2 birds and 5 cats at the moment! I have a black lab, Italian Mastiff, 2 cats, 3 chickens and a snake. We have 3 goldfish that my kids won at the circus. I have two dogs and two cats, plus various smaller things. I don't have any pets. BWallace1980(at)Hotmail(dot)com. We have a guinea pig named Brownie. I have one spoiled rotten cat named Nelson. I adore him. no, I don't have any pets but I have a neighbor pup that likes to come over and visit and get a treat! my daughter has 3 mini dachshunds. No pets, as of yet! We have three female cats - a 8 year old gray cat named Andie, a 10 year old black cat named Spookie and a really, really old yellow tabby named Reeses (she was born when I was in high school and I'm 30 1/2 years old so she has to be at least 15 years old). I don't currently have any pets. I have 4 cats, 1 dog, and 5 puppies. We have 3 dogs and a bird. We have a hound mix. We have 3 cats and 3 dogs. yes we have a dog. We have three cats here at our house. Ibenez, Ozzy, and Buddy are their names. We have 2 elderly dogs, 11 and 13 years old. We also have a cat that we found starving and alone when he was only a few weeks old. He's been with us for almost a year now.